So there you are, eager to run a LARP. You and your friends are big fans of adventure style games, and would prefer them over the backstabbing competitive nature of elysium style LARPs. But you have a problem: You don't have a lot of players, and can't charge them an arm and a leg. You've got to run an adventure style LARP on a budget. Let's say you can reliably recruit 20 players and staff and charge $5-10 per player or staff member per session. Given drop-outs and IOUs, you can't expect much more than a hundred bucks a session. So here are five tips for how to run a well-dressed adventure style game for just $100 a session! LARP is hard work. LARPers need snacks and beverages to keep the energy level up. Having good snacks and drinks around will really help improve your LARP, beyond any income they generate. You can sell snacks and drinks when you have private space, and dress the space appropriately as a party, home base, cafe, or other location where such refreshments are available. Expect to make about fifty cents of profit per player from refreshments, plus five or ten dollars of donations. First, buy refreshments that are good for your game, allowed by your site, and desired by your players. Put them out as part of the set dressing, but place a slotted box next to the refreshments. On the box, write the "suggested donations" list and a promise that all the proceeds will go towards game site, printing, props, and set dressing. Give a range that starts at a number involving coins and ends at a round number. Make the top end of the range close to the higher price that you'd pay for the refreshments at a gas station or convenience store if you stopped in on the way to game. At the end of the game session, give all the players a last chance to give additional donations to the game or buy stuff for the ride home, or to settle up if they didn't donate for stuff they consumed. The profit from the concessions sales will only net you ten dollars an evening, but the additional donations will probably double the pot. It's sure to pay for your printing costs, at the very least. Thank players who provide donations and explain that this is a fundraising tool, so you'll keep providing it as long as it raises money. The biggest challenge for adventure style LARP is game space. I could write a book on this problem and how to solve it, really. First... Bad news live combat LARPers: Unless you live near a very large national or state park with lots of private space, you are not likely to get a good free site for a live combat boffer LARP. You will never be able to get free space for a live combat airsoft LARP. If you can't afford a site for that sort of game, you probably can't afford insurance, and you really, really need insurance for a live combat game. But for the simulated combat adventure style LARPs, such as Vampire or Call of Cthulhu or all the other sim-combat games out there -- there is a lot of opportunity. You can LARP in a mall, bar or nightclub. The benefit is the food and drinks, easy to find event calendars, and friendly (if you tip well) staff. The drawback is the noise and unpredictable (or total lack of) private space to run action scenes. The solution to both of these problems is to use a bar or club district instead of a single bar or club. Select a strip mall or city street with multiple cafes, bars, clubs and restaurants, or a large, popular shopping mall. Decide if you want to ban locations with cover charges or other barriers to entry (e.g. movie theaters) from the list of game space sites. Set limits on how far off the main drag the game space's boundaries are. Ban weapon props (use index cards with words and stats on them) and advise players that their characters will be in public and maybe ought to dress to fit in. Run your action scenes in parking lots, on side streets, and so forth. Limit your action scenes, too. Some action scenes, especially those involving deception and tense negotiation, are great for these sorts of public spaces: "Your goal is to follow the enemy spy and eavesdrop on her conversation with her contact." "Your goal is to negotiate the return of your sire, in exchange for the return of the Ventrue antitribu's sire, without the scene turning violent." "Your goal is to determine which of the visitors is an alien in disguise and capture them when they go to the parking garage." Remember, simulated combat games do not involve actual touching, so capturing an NPC involves some dice or rock-paper-scissors. Make sure your players know that they should not mime violent actions, or they could get arrested. Parks are great for a LARP, as long as you don't live in Buffalo. Wooded areas provide semi-private space where your players will feel more comfortable dressing in costume and setting out set dressings. Just choose one that's big enough that you can get lost in it, and get yourself on all the community email lists for the town around it. You don't want to schedule your LARP alongside the annual stream cleanup, triathalon, jazz festival, or Sunday school scavenger hunt. Some of these events might actually be great for your game, but not if you're taken by surprise. Just because it's a park doesn't mean you can whip out the airsoft MP-5. Do not use realistic gun props in a park. Check with your local police department about any other kinds of props that they might feel worried about. Tell them you're doing a kind of no-contact improvisational theater game called LARP. College campuses are a special kind of public space. If you have a group entirely comprised of students, you have a lot of free reign, and most campus police services actually know what LARP is. If you have non-students, you might want to be a bit more careful. If your game is mostly non-students, you may need to reserve a small space through the student to serve as a home base, then range out from there. A student center, with a food court and meeting rooms, is often the best kind of LARP site. If one of the players has a house they're willing to entertain the LARP at, you're set. But that player should consider it the same as throwing a party. If they are comfortable with the other players coming to their house, it's fine. But if your LARP has walk-ins and visitors (like a network game in One World By Night) or advertises on sites like meetup, your game is not a good candidate for someone's personal home. If you use a personal home, have the host close off areas that are forbidden to the LARP and put signs on the doors forbidding entry during the LARP. If you're the game producer/head GM and you're not the host, you have to stick around to clean up. Yes, that means the dirtiest jobs. Yes, that means the bathroom. You should consider getting cheap event insurance if you use someone's house. And you should have the host check with their homeowner's or renter's insurance policy for any restrictions. For instance, under some policies, damages are not covered if you're hosting an event people have to pay to attend, or for your own profit. In that case, make sure you word the "site fee" as a "suggested donation" and make it clear that none of the money will go to pay the home's owner. I'm not a lawyer, though, so don't take my suggestion as legal advice. Set dressings are even more important at people's homes. This is because they help you block fragile televisions or decorations, cover shelves full of distracting gaming books, and hide those off-limits doors. Not every church thinks role-playing games are the tools of the devil. Some are very friendly towards safe, prosocial, sober, creative activities that keep kids off the street. Ask your troupe if anyone is a member of a church that might be friendly to LARP. They might have event space free to parishioners, or available for a very low fee. Cheap and free sites are great on the budget, but they tend to have two major limitations. First, they tend to be small and have only one room. A typical adventure LARP with more than six or seven players has at least two simultaneous adventure scenes going much of the time. If you intend to use a cheap or free site regularly, design set dressing for it to make it work for your game. I attended a very popular Vampire LARP once that was located in a one room daycare, and they never went to the effort of buying set dressing to disguise the place. Buy a few five yard lengths of cheap black fabric at the arts and crafts store, and get some plain white, tan, brown, and grey sheets at the local goodwill. Use these to dress tables, cover desks in university classrooms, hide Sunday school art on the walls at the church, etc. Lighting is key! A flourescent-lit meeting space seems to transform as soon as you turn off the overhead lights and get some electric candelabras flickering away. A fog machine and strobe light can open a portal to hell. Hide the face of a mysterious patron at the head of a meeting table in a dark room by placing a desk lamp with a 100W bulb behind him, pointed right at the players. Cheap flashlights tend to go out randomly, which makes them excellent props. Raid the after-Halloween sales to get set dressing and props at huge discounts. Focus on set dressings and lighting, since props tend to be more limited use. You can make an indoor space look like an outdoor space with a single street sign or lamp post. Buy the cheapest lamp post light at Home Depot (solar powered post-cap lights or large garden stick-lights might be better, since they will actually light up), a 6' length of PVC pipe, and a can of black spray paint to paint the pipe black. Use a Christmas tree stand to keep the post upright. Buy an old, oversized blazer or vest at the goodwill. When players temporarily take the role of NPCs for you, have them wear it so the other players know they're a different character for the time. Don't underestimate the value of sound. Get a good speaker, plug your laptop or ipad into it, and dress your set as a busy train station, remote mansion in a thunderstorm, ancient ruin, or dripping sewer by purchasing or streaming ambient sound effects (search sites like http://tabletopaudio.com/ or www.youtube.com). If you have the budget, garage space, and game space, construct some theater flats (broadway flats are fine and easier to store): http://www.wikihow.com/Build-a-Theatre-Flat The materials for these are cheap, especially if you have some old paint and screws lying around the house anyway. Constructing them is easy. The hard part is storing them, transporting them, and getting space big enough to justify using them. If you run a game at a convention and get your own room, or somehow get a school cafeteria, it's likely to be a huge open space. Not ideal. Just six broadway style flats will turn a 25'x50' meeting room at a con into four private spaces for your game. The picture below has a meeting table, two tight spaces on the left side, and a library or laboratory on the right. Also, use the outdoors. Get to know the area around your tiny, imperfect site. Follow the paths, sidewalks, and streets in every direction for five minutes to find out what's a five minute walk away. There might be some nice secluded areas: a picnic table behind the site, a playlot across the street, a quiet alley without any residences off of it (residents might get mad), or a little square with benches and modern art. 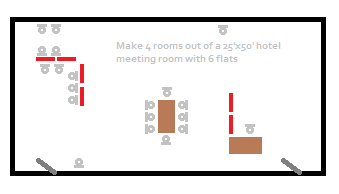 Draw a map for the players so they see all the space they can use. Give the map to the people writing and designing your adventure scenes, too, so they can set the scenes in the appropriate sized space. Important note: Tell players that if they want to use their personal cars as LARP props, they're required to have comprehensive insurance, and that they have to sign a liability waiver for the LARP (find some for free on google, search for "larp liability waiver"). That way, they're covered (after the deductible) if something happens to the car. Note that none of this is meant to be legal advice; I am not a lawyer. Consult a real lawyer if you have any questions! Finally, use the local businesses. Get the hours of the businesses nearby, and include any that seem appropriate in your game space in your site boundaries handout. Maybe you only have one room in an art center for your Dresden Files LARP, but if that art center is one block from an all night parking garage, a cheap Chinese restaurant that's open until ten, a sports bar, a Starbucks that's open until nine, and a 24-hour Circle-K, you've dramatically expanded your game space. Free game spaces come with a lot of restrictions. Parks have odd hours and tend to have regular folks strolling through. University buildings tend to have limited hours and classes, study groups, and events appear unexpectedly. Bars, cafes, malls, and other public commercial spaces are loud and very public. And players' houses come with all kinds of risks and restrictions. $200 goes a long way for a site fee. It can rent back rooms at restaurants, multiple meeting rooms on college campuses or in community centers, party space at most apartment complexes, and practice space in community or college theaters (remember, LARP is basically a kind of theater). $200 can rent four rooms at a cheap motel, two at a half-decent one, or a suite in the off-season in a resort town. It's a long shot, but you might be able to secure great free or cheap paid space at a game cafe or game store. With a game store, your most likely outcome is to get permission to use a game store as a home base for opening and closing ceremonies, and to store GM stuff. The LARP would have to take place in the strip mall or streets around the game store. See Malls, Bars and Clubs under #2, above. If your town has a game cafe, you might be in for a treat. A game cafe is a semi-new business that combines coffee shop or bistro with table games. They either rent tables or set other limits to keep turnover high. A LARP is a great proposition for these places: By giving or renting the LARP just a few tables, they get twenty customers ordering coffee and snacks, and half the time the LARPers are outside wandering the block. Not only is the place guaranteed to be gamer-friendly, but depending on their business model, you may be able to get great cheap space, enthusiastically friendly and understanding staff, and good food. Heck, the staff might even be willing to help the game out by passing messages and other fun thing. Just make sure your LARP supports their profit margin nicely. Sites are definitely tricky ones! At least for smaller scenes you may be able to get away with booking a room in your local library (if they have them) which can be free. Also if you can run a game on a week day afternoon or evening (barring Fridays) you can often get it cheaper as well, which is worth consideration for those games that have "loose scenes or RtRs" where not everyone is expected to attend. Good point. A lot of OWBN/Cam games around here run on work nights to take advantage of these principles (and so as not to trod on one another's player base).